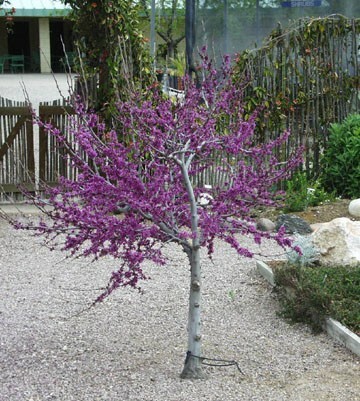 Cercis occidentalis-Western Redbud-This small tree is beautiful in all seasons. It is very ornamental and can be grown as a Bonsai. This multi-trunked tree can get fromm 6-20 feet tall. Large masses of brilliant rose-purple blossoms appear in Spring followed by long lime green seed pods that turn into a purplish brown color. The round heart shaped leaves emerge apple green but develop a bluish green color. In colder areas during fall season they will get yellow and red. Plant in well drained soil. This tree attracts hummingbirds and is drought tolerant. Can withstand temps as low as 10 degrees.